Two tense draws and a thrilling win for the Cobras saw three tempting advertisements for first-class cricket this weekend. All three matches were affected by bad light, and only in Benoni, were the Cobras able to win the race against time and register a win. The Cobras fielded first in Benoni and bowled the Titans out for 313. Jacques Rudolph made his desire for a national call-up clear with a crisp 110. Farhaan Berhardien (72) and Roelof van der Merwe (50) were the other big run scorers for the hosts. But the Titans lost their last seven wickets for 98 runs; Claude Henderson, who was making a return for the Cobras, was the chief assassin, claiming seven wickets for 108. In response, the Cobras were venomous. Stiaan van Zyl's career-best 172, with contributions from Andrew Puttick (62), Justin Ontong (51), Justin Kemp (49) and Ryan Canning (46) took them to 508, giving them a lead of 195. The match was won and lost in the Titans' second innings. Rudolph (38) and Blake Snijman (42) put on 72 for the first wicket and Berhardien added 44 batting at No. 4. But in audacious spell, Ontong (3/20) removed Gulam Bodi (24) and Mangaliso Mosehle (17). Faf du Plessis (9) was run-out, to leave the Titans on 185 for 5, still 10 runs behind. Shaun von Berg ground out 37 off 116 balls as the lower order spent time at the crease. Eventually, the Titans were bowled out for 271 with Henderson (3/88) taking his match tally to ten. The Cobras needed 77 runs to win and made heavy weather of their task. They lost Andrew Puttick (3), Omphile Ramela (16) and Ontong (16) but managed to reach the target in fading light. The Cobras have moved to No. 2 on the table, 0.54 points behind the Titans. Up the road in Johannesburg, the Lions and Knights drew their game. Light had affected the match severely on the first day, which saw play end just after 3pm. The Knights were bowled out for 372. Ryan Bailey top scored with 94 and Dean Elgar (84) and Reeza Hendricks (65) also made healthy scores. Craig Alexander picked up 5 for 88. The Lions response was sublime as they totalled 482, to lead by 110. Yet again, not one of their batsmen managed a century in a big total, but Vaughn van Jaarsveld (97) and Neil McKenzie (94) came close. The hosts were bowled out on the fourth morning of the match and a draw looked likely. The Knights put up a solid first-wicket partnership of 68 in their second innings. Elgar (16) was a spectator as Hendricks (124) scored the bulk of the runs. Hendricks, who went on to score his sixth first-class hundred, was the mainstay in an innings that saw no other batsmen get past 20. Paul Harris spun his way to 5 for 34 as the Knights were disarmed with speed. They declared on 204 for 9, setting the Lions 94 to win and bizarrely, with at least half an hour of light left, the captains shook hands on the draw. In Pietermartizburg, the pre-match headlines were stolen by the return of Kevin Pietersen. 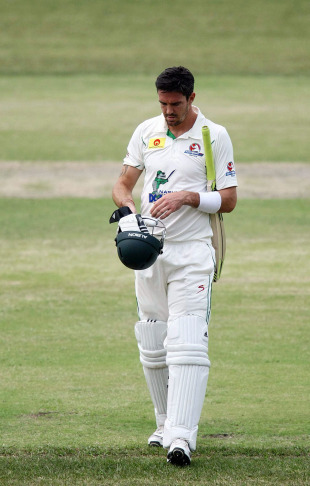 Pietersen scored just 36 in the Dolphins total of 500 for 6 declared. Imraan Khan's career-best 169 and Ahmed Amla's 102 were the highlights of the innings. The Warriors were in immediate trouble, losing Bevan Bennett with no run on the board. They went off for bad light and returned to play two overs and lost Jon-Jon Smuts with the score on 2. The top and middle order were shot out as the Warriors stumbled to 50 for 5. Craig Thyssen (30), Justin Kreusch (37) and Lyall Meyer (30*) provided some resistance before the Warriors were bowled out for 156. Quinton Friend (4/42) and Imran Tahir (4/27) shared eight wickets between them. The Dolphins enforced the follow-on and the Warriors were staring at an innings-defeat at 22 for 2. Prince (123) scored his second century in as many matches and just about saved the Eastern Capers. Tahir weaved his way to 5 for 126 and had the Warriors teetering on 303 for 9. But the clouds rolled in to save the Warriors, who were still trailing by 41 runs when the match was drawn. They remain at the bottom of the table. Batsman of the week: For the most widely anticipated 36 ever scored, Kevin Pietersen wins the award ahead of all of centurions in this week's matches. Special mentions to Imraan Khan and Stiaan van Zyl for their career-best knocks. Bowler of the week: A blast from the past and a match-winning ten-wicket haul from Claude Henderson earns him the second rounds' title.